The key to success in social media is promoting your brand in a low-key non-salesy way. Ideally, you want people to share your posts and help spread the word. People love fun images, and they also love quotes. Combine the two, and you’ve got a very shareable post– perfect for Twitter, Facebook, your company blog. Here’s a great quote about storytelling. 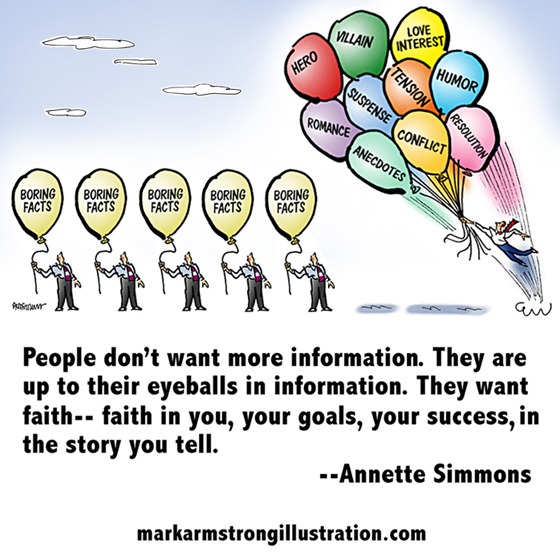 Annette Simmons believes that story always improves communication. The above is a good example of how images can be recycled, which makes them a good investment. I’d previously used this “balloon image” for a post called 10 Storytelling Essentials. By including the URL for my website, I insure that my brand gets promoted whenever someone shares the illustrated quote. Here’s one by blues legend B.B. King who died earlier this year. The quote is inspiring because it highlights his work ethic, and says very clearly: if you want to be good, you’ve got to put in the time. It’s nice to have your brand associated with dedication and hard work. on every social media channel. You have to find the ones that work best for you. to move forward, you have to view them as learning opportunities. Here’s another example of creative recycling. The image is an old editorial illustration. 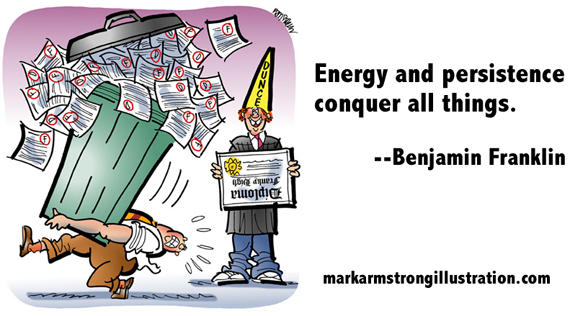 I’ve forgotten the related news item, but the image seemed like a fun fit for this Ben Franklin quote about the value of persistence. 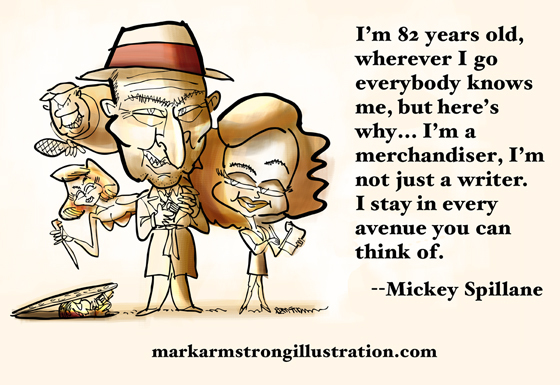 I did a birthday tribute back in March for detective fiction writer Mickey Spillane. He left behind some colorful quotes, including this one. He died in 2006, but he was ahead of his time. He would have excelled at social media marketing. The image below started out as a poster with the caption: Don’t settle for a still life. Always resist the temptation to recycle an image too frequently. It will lose power. Use it, then put it back on the shelf for awhile. When the time is right, trot it out again, and pair it with a new quote. Do you promote your brand on social media? Care to share your strategy? Do you share or retweet posts? If so, what usually prompts you to do so? Do you have a favorite quote? Seen a good one lately? I’d love to hear it. I share work I find interesting and admire. In fact that is one reason why I use twitter or fb [the other would be to promote my work]. You, my dear friend, fall under a category of your own of someone who’s work I admire and share EVERYWHERE, as I feel I owe it to humanity! Don’t have a strategy yet but thought your article was great – some excellent tips! I appreciate the tips, Mark. 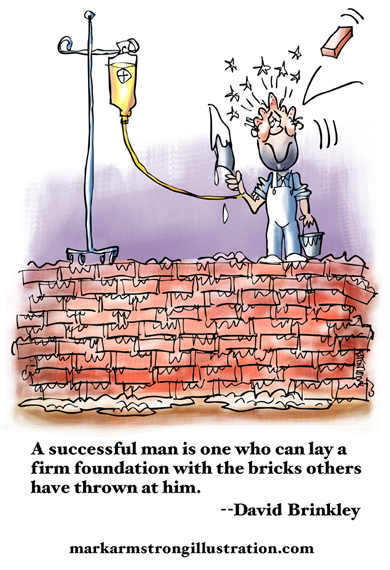 As for quotes, my favourite here is the David Brinkley – so very apt. As for a promotion strategy – I’m still working that out. 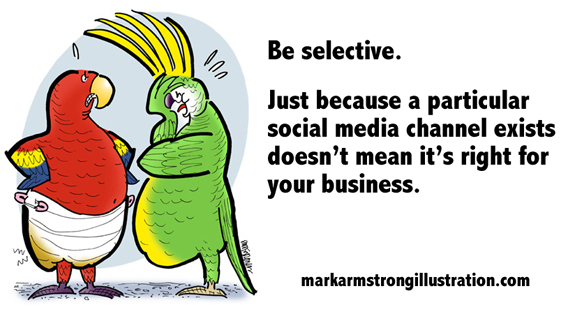 I particularly appreciate your suggestion to be selective with social media platforms. I had many quotes on my MySpace page a long time ago. I put them on my Facebook timeline years ago, but no one reads anyone’s timelines anymore. Here are a few of my favorites. Hi, Steven! Always great to see you, and I apologize for being so late in responding to your comment and your wonderful quote collection. I loved them all, and every one seemed to hit like a hammer. Thanks for sharing those provocative quotes, and for all your thoughtful contributions to this blog. I look at my artwork and writing as fabrications of my perception of what is true. But I always strive to be truthful (or show truth) in the fabrications I make. Author Stephen King said he tries to be truthful in the lies he tells. Same here. Thanks, Steven. I think the word “fabrication” may be the sticking point here– a cause of confusion. We all perceive reality differently, so our version of same must necessarily be inaccurate to some degree. Norman Rockwell certainly romanticized and/or idealized certain scenes. Oscar Hammerstein romanticized love in his song lyrics. I think we all know the “truth” of the matter is different, but it seems rather harsh to accuse such artists of lies or fabrication. They gave us something to strive for, which should be one of the aims of art, at least IMO. As for political cartoonists and pulp paperback cover artists, the charge of fabrication is, perhaps, more accurate!! 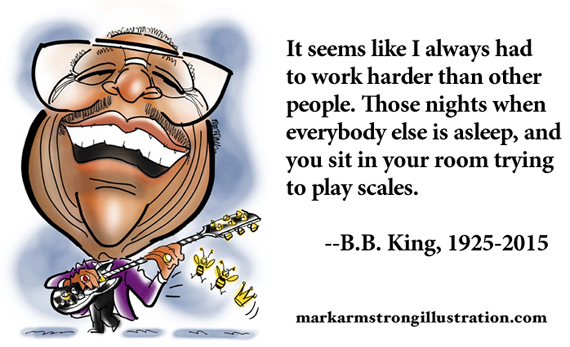 Still, I’m sure the former at least would echo Mr. King: editorial cartooning is very much the pursuit of truth via distortion and exaggeration. Thanks again for your most interesting contribution here! Ask not what the world can do to amuse you; ask what you can do to amuse the world! Your blog looks very promising. Your current header image is certainly chaotic, but the colors are rather dark and muted. I think something bright and cheerful would be a better match for the “voice” I hear speaking in your comment. Since there are two of you (with different personalities) working on the blog, how about this: two cartoon character artists, boy-girl, wearing berets and paint-stained smocks, standing back-to-back, each working furiously on a large canvas on an easel. Put whatever you like on the two canvases, but make them different– like you’re competing against each other, each trying to be the more chaotic. Every so often you could use Photoshop to change what’s on the canvases and give your header image a fresh look. Just an idea. Il tuo blog sembra molto promettente. La tua immagine di intestazione attuale è certamente caotico, ma i colori sono piuttosto scuro e in sordina. Penso che qualcosa di luminoso e allegro sarebbe una migliore corrispondenza per la “voce” Ho sentito parlare in tuo commento. Visto che ci sono due di voi (con diverse personalità) che lavorano sul blog, che ne dici di questo: due artisti personaggio dei cartoni animati, ragazzo-ragazza, indossando berretti e grembiuli vernice macchiata, in piedi back-to-back, ognuno dei quali lavora furiosamente su un grande tela su un cavalletto. Metti quello che vuoi per le due tele, ma li fai different– come si è in competizione l’uno contro l’altro, cercando di essere il più caotico. Ogni tanto si può usare Photoshop per cambiare ciò che è sulle tele e dare l’immagine di intestazione un cambio di look. Solo un’idea. Your illustrations really make them seizing! I love how you do your work, how you know to exploit your drawings to it’s most (the fruits in a basket drawing), and also giving a bit a knowledge to other illustrators, it really helps, thanks for your awesome work! Exactly, and finding quotes that describe our way of thinking, knowing that it came out of the mouth of another, in some ways feels reassuring, would it be that or a life lesson taught! I’m sure the authors would approve, and even if they don’t, there are many many people that will be there to approve of them! Ha! Yes, quotes can be wonderfully reassuring. There are few happier experiences in life than suddenly knowing one is not alone in feeling a certain way. Yes, in the end nobody can be truly alone, but nobody can be perfectly conscious of that. Exactly, we need different people with different tastes, claiming only one aesthetics for our whole population wouldn’t be as wonderful as the diversity in art (well, that we can already observe with the image sold of women, but I’m not sure if I can Fit that in this context though). I love illustrated quotes. Thank you for sharing this post! I just discovered your site and I’m looking forward to soaking up all of the wisdom you share here!! Hi, Eva! Thank you for your lovely comment. 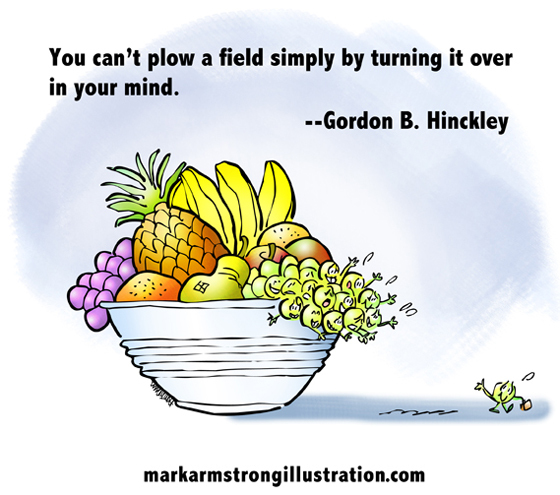 An illustrated quote fan? Excellent! They do seem perfect for social media: an eye-catching visual, some short pithy text, a dash of humor. Just the sort of thing people like to share, which translates to high engagement for brands.